Inventory We are a resale marketplace, not a box office or venue. Ticket prices may exceed face value. This site is not owned by Pinnacle Bank Arena . 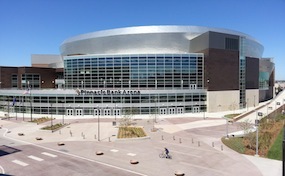 The Pinnacle Bank Arena opened in 2011 as home to the University of Nebraska's men's and women's NCAA basketball teams. The Pinnacle Bank Arena box office is located on the Cornhusker's campus and is available for all ticket needs. The venue has a seating capacity of 16,130 for concerts and 14,970 for basketball. It was known as the Lincoln Haymarket Arena until 2012. Pink is scheduled to play one of the first major concerts at the venue. ArenaLinclon.com is not an official website, box office, and or venue. We are a privately owned and operated company that specializes in finding tickets to all events online in the secondary ticket market. Prices on our sites can be below or above face value and will change quickly with demand. To order tickets to all Pinnacle Bank Arena Lincoln events please follow the steps online through the checkout or call our operators at anytime.